Cranford, NJ—The small township of West Milford, NJ has become the scene of the latest attack on atheists. 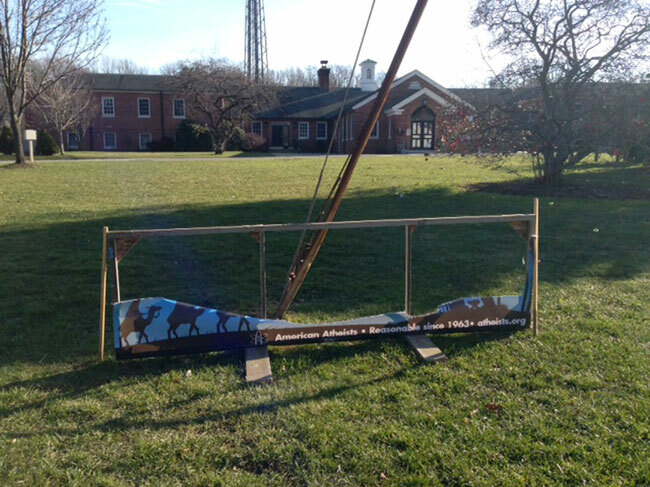 Vandals allegedly destroyed a banner donated by American Atheists for the township holiday display after local City Councilman Joseph Smolinski appeared to advocate its theft. According to an article in the NorthJersey.com news source, Smolinski was adamant that the [atheist banner] be taken down in spite of any legal implications, adding that he was surprised no individual acted alone to remove it from municipal property. Smolinski said he, for one, would turn the other cheek if they did. Just days after this statement, the banner was destroyed. A township resident, Gary Steele, contacted American Atheists about using the “You Know It’s A Myth” billboard in the West Milford, NJ holiday display. Mr. Steele erected the banner on Sunday, December 16, 2012.